Geek Girls Rule! #276 – Feminist Frequency or My Raging Girl Crush on Anita Sarkeesian – Geek Girls Rule!!! Anita Sarkeesian posing in front of videogames no doubt purchased with male tears of ultimate sadness. 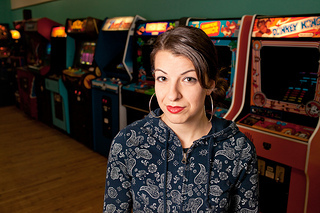 I already adored Anita Sarkeesian’s Feminist Frequency vlogcast, but after she announced her plan to do a Tropes in Videogames series, and the weeping and wailing of tiny man egos began, and her refusal to back down in the face of some truly monstrous internet abuse and vicious personal attacks, I decided she was my hero. We’re four episodes in to Feminist Frequency Tropes -vs- Women Videogames, and I’m loving all of the videos so far. Because of the ubiquity of the Damsel in Distress trope, she dedicates three half hour episodes to this trope, dividing them into the History of the Trope, the new “dark and edgy” versions of the Trope, and the final installment, Dudes in Distress. The final installment points out just how few Dudes in Distress type games there are, she comes up with six, and highlights some games that avoid this trope, like Where is My Heart, which was reviewed here when it first came out. In case you don’t remember, it’s the fatally cute Scandinavian platformer that provided much challenging gameplay and all the adorbs. The lastest episode is Ms. Male Character, where she talks about videogame characters that are essentially just “girled down” versions of existant male characters. From Ms. Pac Man (which honestly was a vastly more challenging game at which I am awesome*), to the girl Koopa in later Mario games, to Maxwell’s sister Lily in the latest Scribblenauts, these characters have no identifying characteristics to distinguish them from their male counterparts, except being girls. Much like with the Smurfs, where all the other Smurfs had names that indicated an interest or skill, Brainy Smurf, Lazy Smurf, Reporter Smurf, Tailor Smurf, Farmer Smurf, and Smurfette… whose only interest was she was a girl, apparently. Ok, guys, while it can be pretty exciting being a woman, I mean, that whole bleeding, cramps, less pay for the same work and being talked over during discussions, for example, but it isn’t an interest or a skill in the same way that being Brainy or a Farmer is. ** As Ms. Sarkeesian explains this just further enforces the idea of male characters as the norm, and female characters as some sort of special class. Women make up roughly 50% of the world’s population is female. And we’re catching up in percentage of videogames played and purchased. Isn’t about time that videogames quit acting like we have cooties, or we all want to play Cooking Mama. I really hate that game. It is so far from anything that interests me, it’s like we don’t even inhabit the same space time continuum. As Ms. Sarkeesian said in the video, while Bioware may have blown the marketing for Mass Effect, at least they got it right in the actual game. *I may indeed have had my initials on nearly every Ms. Pac Man machine in Boise, ID in the 1980s. After you played it all the way through, it just restarted, FASTER. **There is something to be said for the performance of femininity as a skill, but that is a different conversation. I have really been enjoying this series, and it’s been an eye opener for me, and I like to think that I’m pretty good on catching the garbage in video games. It’s no surprise that there’s always something more to learn. Here is an idea instead of feeling sorry for yourself about the supposed treatment of women in video games, or about being women in general, fund and develops your own video game, one that will conform to your feminist ideological sensibilities, and see if it sells, let the FREE market decide……if this is not possible, could you explain why? Well, we can start with a culture that pushes women away from coding and game design, as well as the STEM fields and engineering. And then add to that the lack of money and time on the part of women, who MIGHT have the skills, but still have to make livings and are still expected to do the bulk of housework and child-rearing even when married. I could also point out that when games with female characters make it big, it is ascribed to a fluke (Lara Croft as an “exceptional girl”). Many games with women designers are starting to have an impact, in independent circles, but as a game designer on tumblr said, as far as the big studios are concerned, designers want to make the games feminists say they want, and the marketing departments are shooting them down in development. I could also point out that at no point am I feeling sorry for myself. I kind of feel sorry for the narrow-minded sexist shitheads who think the only worthwhile games are shoot-em-ups with white, straight, male heroes. I just wish games companies would quit catering to the lowest common denominator and be as awesome as they could be. With the ability of more and more small indie companies to start producing games that are actually good and interesting, instead of just T&A and explosions, the rest of you all are going to get left behind. The “FREE” market is a myth anyway. People are not completely rational actors, acting on ruggedly individualist views reasoned out from first principles. We’re influenced by the society in which we live. Just look at the common reaction of most gamers on the internet to the idea of women in games – they cannot conceive of a game having a female protagonist at the same time as a good story. Apparently, we either choose to “pander to feminist dogma” or we have a good game. No other options are presented or acknowledged. Given that this is the current climate, where people dismiss the first Assassin’s Creed game to feature a female lead as crap without having bothered to play it*, can we really expect enough people to see through the propaganda of the false women/quality dichotomy? That said, look at some of the games that approach conformity to our “feminist ideological sensibilities”; Portal, Mirror’s Edge, Hydrophobia: Prophecy, Beyond Good & Evil, The Longest Journey. They’re not just not bad, they’re good. They’re thoughtful, interesting, and challenging. They’re not perfect, but having decent depictions of female characters doesn’t harm these games in any way. They’re excellent games, but a lot of gamers won’t touch them because “girls ruin games” and worshipping the free market won’t make a difference to that attitude. But getting gamers to think (because a lot of us really are capable of being thoughtful) will make a huge difference. So, yeah, more Feminist Frequency, more Geek Girls Rule!, more feminist gamer media. Hell, more guys whining about women wanting to be treated like humans in games too, because that gets those of us who aren’t opposed to taking women seriously to speak up about the irrational nonsense that’s swirling around. Then, when society has a rational opinion of women, then we can expect the free market to achieve something. * Having played it, I can say it’s actually quite good. It’s obviously a port from a handheld console and limited in scope as a result, and the voice acting could be much better, but it’s far from crap. Previous Post Geek Girls Rule! #275 – So that NaBloPoMo thing… or Life Happens. Next Post Geek Girls Rule! #277 – Happy Thanksgiving and Help Out an Awesome Dude!